Hey Everyone, we hope all of you had a great weekend! Ours ended with a very nice email from one of our first Kitka submitters, Juliana Neufeld (click to be sure to check out her old space, to see how things have evolved!). She’s got a new place and sent some photos to share! 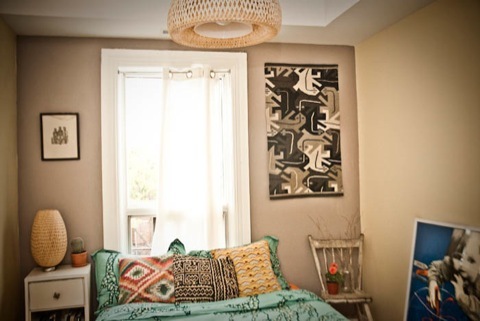 BTW, we love the idea of using a black board wall as a large mural canvas, to be changed up once and awhile. If only we weren’t so graphically challenged here at Kitka! Me, Juliana Neufeld, illustrator and painter and Sammy Rawal, music video director and photographer both lived in a basement prior to our current apartment and were craving hardwood and light when we started our search for a new dwelling. We found a lovely 3rd floor Apartment at College and Gladstone with skylights in the kitchen and bathroom and a nice sized patio. 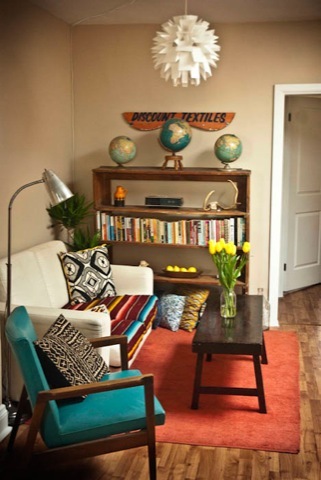 Sammy and I have similar graphic sensibilities so we were both so excited to decorate the place, combining our love of thrift and antique store finds with bold textiles, graphic lines and colour. We knew when we moved into a larger space that we wanted to do a blackboard wall. 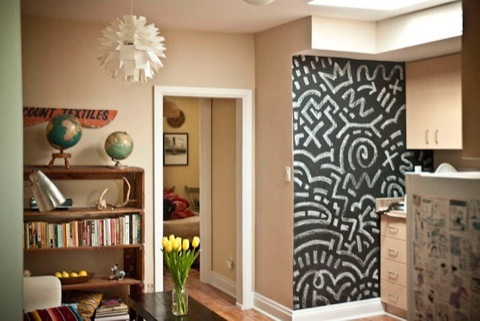 Right now we have a Keith Haring-esque drawing going on, but we like to change it up every month, to give the whole kitchen/living room area a totally different vibe. I’ve got plans to draw a giant owl mural next. Everything displayed on these shelves are gifts from friends and loved ones over the years. 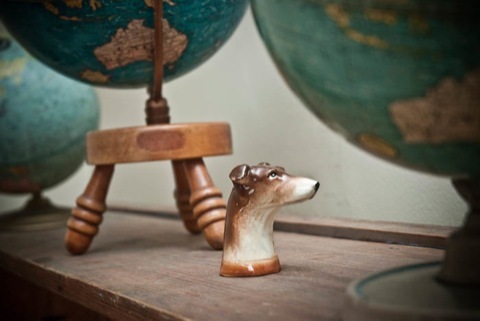 The combination of sentimental value and good design make these items pretty priceless to both of us. The table was a good find at Cindiloowhoo on Ossington.We have plans to paint the chairs a glossy white but haven’t found the time yet. A good summer project, I guess. 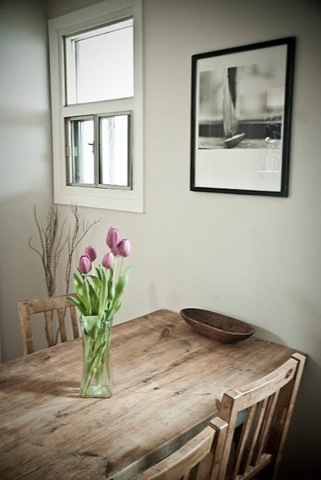 The image above the table is a beautiful photograph of a silver toy sail boat by friend and fellow Ryerson photo graduate Chris Boyne. 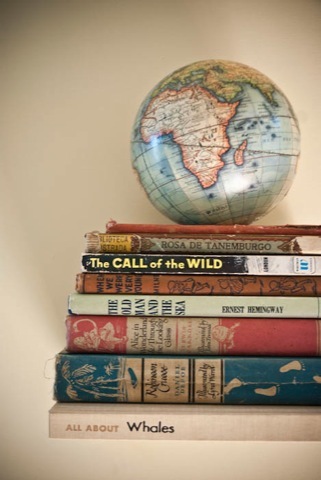 We had a little wall space snuggled in between the hall dividing our bedrooms, so we decided to throw up some of our old favorite books. 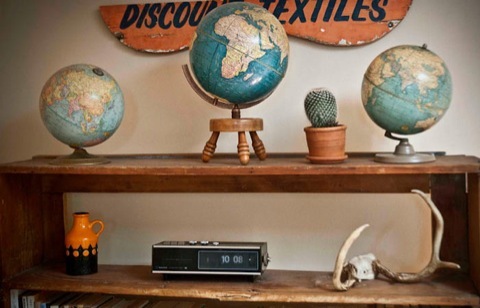 We have more globes than we know what to do with, so the floating shelf was a perfect space to balance one of them. My bedroom is still a work in progress..I get so excited about textiles and can’t help picking them up wherever I travel. It’s always a fun challenge trying to balance and layer them in ways that still project a sense of calm. The chair was a $15 Roncesvalles find and the framed poster I found (and fell head over heels for) at The Public Butter in Parkdale. 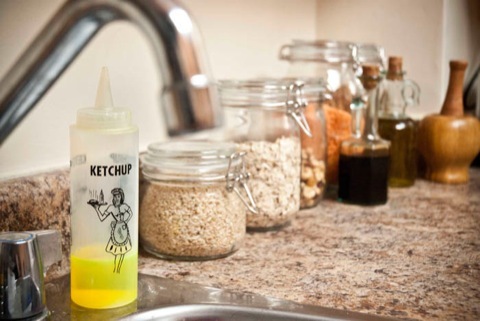 I found this adorable old ketchup squeeze bottle at the downstairs of 69 Vintage on Bloor, which is now a perfect dispenser for dishwashing soap. 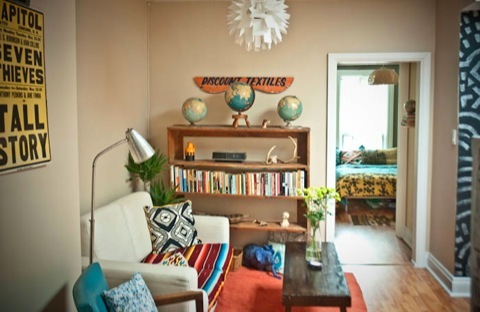 The living room is an eclectic mix of our finds over the years. The apartment is by no means big, but we’ve managed to get lots of “stuff” in here. The newest find was a vintage film poster advertising the sixties films “Seven Thieves” and “Tall Story” that I picked up at Queen West Antiques in Roncesvalles. A major work in progress…We have plans to let greenery take over the space. 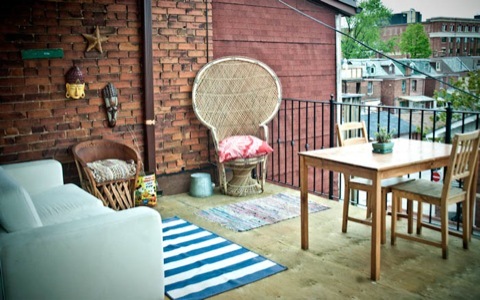 Would love to get vines, some potted trees and plants scattered around the patio. And of course a BBQ! This pup is one half of a salt and pepper duo that I found at a friend’s garage sale. I kind of like him better all by himself. 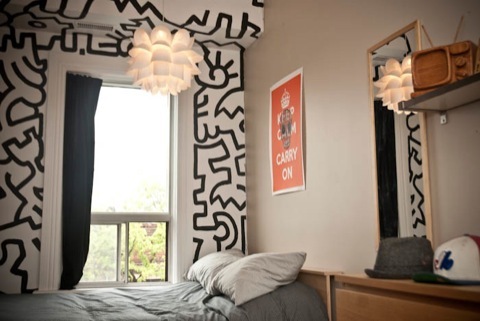 Sammy painted this awesome Keith Haring mural on his wall. 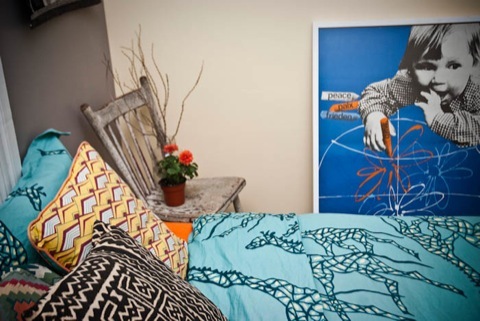 And the the poster above the bed is Artist John Todd’s adaptation of the Keep Calm Carry On poster from Function 13 in Kensington market.